Don't forget the traditional tea ceremony! sum-up of the wedding vibe: Cozy celebration wrapped in lights, laughter, and love amid a Toronto blizzard. Our venue. Toronto can be a difficult city to host a wedding, financially speaking. We were grateful to find a venue that 1) didn’t charge for space rental, and 2) helped us set up, move furniture, serve guests, and clean up without any extra fees. Rish, Hotel Ocho’s wedding coordinator, was thorough, helpful, and responsive. Our music. Those who know us were surprised that Frank and I didn’t splurge on wedding music, since we both love to sing, and I love to dance. Instead, our talented friends learned challenging songs for the ceremony and made it magical and intimate (shout out to Lydia and Sam!). A few months before the wedding, Frank downloaded a DJ app and mixed a special playlist of our favorites for the wedding. When a cousin threw down his breakdancing moves, it was the icing on the cake. Photography and flowers. When Frank and I decided to get married, the first vendor we contacted was Aisling from Oak & Myrrh Photography. We are so glad that she was there to catch the moments with her skilled and tasteful eye. She perfectly captured the day’s emotions and light. We especially cherish her photos of our family and loved ones. 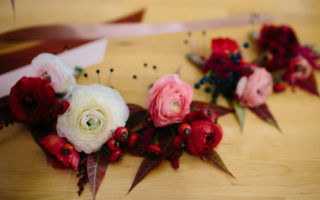 When the wedding planning process began, I was determined to be “practical.” If we were going to have flowers, they would be inexpensive and easy, or we just wouldn’t have them. We decided on evergreen foliage, because evergreens are cheap and abundant in the winter. Right? Turns out, evergreens are pretty hard to find after Christmas. I was disappointed and then felt guilty for being disappointed about something as “frivolous” as decorations. Frank helped me accept that the fresh foliage was more important to me than I would admit. And that was okay! We ended up buying all kinds of fresh greenery from local flower markets. With help from my bridesmaids and a bridesmaid’s mother, we created the arrangements. One of my favorite memories from the wedding week was the afternoon we made the arrangements—laughing with each other as we jabbed stems into vases and coated our hands in sticky eucalyptus sap. Trust your friends when they say everything will be okay. In the middle of a meltdown over difficult conversations, doubts, and family drama, a friend told me that she believed in me and Frank and in our mettle. That no matter what happened, she had confidence in us, and the people who loved us would continue to love us. When I felt overwhelmed, her words reminded me that I could handle whatever problem, and I wouldn’t have to do it alone. Hearing Frank’s vows for the first time at the altar. We each wrote our own vows and, true to ourselves, finished them the night before the wedding. His words were the right mix of funny and sweet, poignant and practical. When he said, “If you ever leave me, I’m coming with you,” the whole room erupted with laughter and my heart felt like it would burst. I loved that he labored to find the right words for his commitment to me and our marriage.